I like Nigella's fluid and accessible writing style. I love the way she coined her words and some of the names of her dishes really cracked me up.Take this Arabian inspired desserts, Figs For A Thousand and One Nights. A very simple dessert which can be done in 5 minutes which she says is scarcely a recipe really, but so good. I have just bought some Israeli Figs from the supermarket. It was only recently the supermarkets here started selling fresh figs from Israel and Turkey. These were bought at a sales price of S$2.70 for 4. I have already bookmarked a recipe from Donna Hay's Fast Fresh Simple to to make a fig and gorgonzala tart,but changed my mind after I saw a bottle of rosewater and orange-flower water in the cupboard. I was then baking Nigella's Kitchen Everyday Brownies for my sister. I have not opened the orange-flower water since I bought it from the Middle East two years ago. I remembered this recipe from Nigella's Forever Summer which uses both essence in this dessert. While the brownies was baking in the oven, I quickly washed and quartered the figs and prepared the butter sauce. It was a very fast 1-2 minutes preparation.. As soon as the brownies was done, I increased the oven temperature to about 250C and grilled the figs for 5 minutes. Quarter the figs, taking care not to cut all the way through the bottom, and place in a heat proof dish into which they fit snugly. Melt the butter in a small saucepan, then add the cinnamon, sugar and flower waters. Stir to combine and pour into the figs. Blister under the hot grill or bake in the oven for a few minutes and then serve; it's that quick. Just give each person a couple of figs on a side plate. Splodge alongside some mascarpone over which you drizzle some of the conker-dark syrup, then sprinkle over some of those green,green shards of pistachio. (vanilla ice cream). It is very good with a scoop of vanilla ice cream. One scoop is not enough to Feed for A Thousand and One Nights. Note:One Thousand and One Nights is known in English as Arabian Nights. It is a compilation of folk tales from the West and South Asian in Arabic during the Islamic Golden Age. Please note that "Ali Baba and Forty Thieves", "Sinbad", "Aladdin" are Middle Eastern folk tales, but were not part of Arabian Nights in Arabic versions. These are the sliced Everyday Brownies I made today. I have baked them before and mudt have forgotten how good they were until I saw Zoe baked them with her son. I just love the gooey goop of chocolates. I used Valrhona cocoa powder and Cadbury dark chocolate bar 70%. Sift together the cocoa powder, flour, bicarb,salt and then stir into the pan; when mixed (this will be a very dry mixture, and not wholly blended at this stage), remove from the heat. Stir in the chopped chocolate and quickly pour and scrape into a baking tin and bake for approximately 20 minutes. It will look set, dark and dry on top, but when you feel the surface, you will sense it is still wobbly underneath and a cake tester will come gooey. This is desirable. The barren fig tree represents people, and being "barren" represents sin. The parable tells us that the barren tree is given more time so it can produce fruit. If it continues being barren(sinful), eventually it will be cut down. We are just like the fig trees, unless we repent (become fruitful), we will surely perish. Hi Lian! Thank you for introducing such a simple, fun and interesting dessert! Try it, perfect for a middle eastern theme dinner parties. Hi Joyce, I heard the best figs are the black mission figs and I would love to try those. I love fig but the last I had was tasteless and not nice. Wish we have more choices or brands to chose from afterall, it is not cheap to eat these. Agree with you, Edith Most of the figs sold are a bit overripe and not sweet. This recipe is good for them. 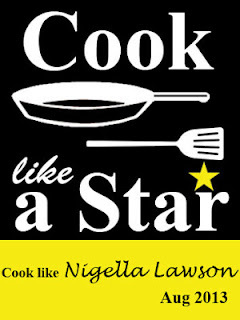 Lovely choices from Nigella, perfectly done by you! Hi Lian, both desserts look so heavenly! Like those served in a restaurant! Hi Jasline, Thanks for your kind comment. Making two desserts for 1 post... Wow! Glad that you like Nigella's everyday brownies. It is so easy to bake. Yes, Zoe, two easy desserts within an hour. Great! and look at those gooey fudgy brownies...yumz! Hi Alice, Be selective when you see these figs at the supermarket, especially NTUC. They are too ripe. Hi Lena, glad you like the verse. I think this dessert is quite impressive though it is really nothing much.